I'm sure those of you who saw yesterday's post about the leaked image of the Hot Wheels version of the yet-to-be-revealed new Viper, and were viewing it on a computer newer than a Commodore 64 probably were a bit disappointed with the quality of the image. 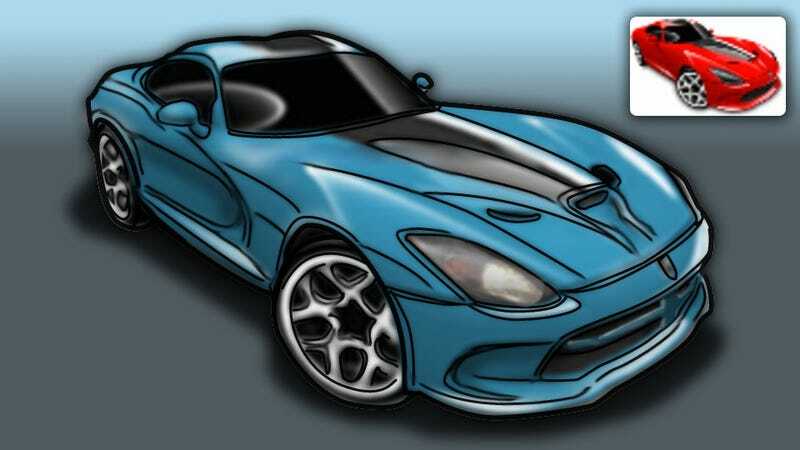 2013 SRT Viper: Is This Hot Wheels Car It? Well, we feel your pain. But, unlike most of the Internet, who's just going to point and laugh at you, we decided to do something about it. So we fed the blurry, pixellated image into the Jalopnik Experimental Dynamic Image Processor (JEDIP), located on a barge anchored off the coast of Long Beach, CA. After many hours of algorithms, processing, and one small fire, the dot-matrix printer on JEDIP ground out this image, which we scanned and uploaded. Will it be accurate to the real thing? We'll know soon, when the car is revealed at the New York Auto Show. I've got a good feeling about it!